*This version supports the US and JAP regions of the ROM (Cody and Guy variations). It also includes support for the additional music tracks including SPC per track fallback. Only the Guy Japan patch is compatible with Gnawtor's Unofficial 2-Player hack. **All PCM packs hosted here are fully compatible with the multi-region patch. Thanks Relikk for updating your set "lightning" fast. Much appreciated. Señor Ventura wrote: At least, cody and guy together in a hack with the three characters being eligible. Great news, where can I find the patch? What is the difference between the v1.0 and v1.3 patches? Edit: Nevermind--it looks like v1.0 is v1.3 for the Guy versions. Ok, I had an itch to revisit this one. I went ahead and improved the loop points for the Sega CD tracks. I also patched support for the bonus tracks to play in select stages. So far, I created the patch only for the Cody version of Final Final Fight. Eventually, I will update the Guy and Jap versions too. Please, remember, to download the ffc-msu1-pev-pcm-set-final.rar to get the improved PCMs and the bonus tracks (if you plan to use the latest FF-Cody v1.4 patch to play them). Would it be possible to convert the Final Fight version of Sega CD to Super Nintendo? Can anyone? The best way to play Final Fight is the arcade version in mame2003-plus - it has support for external music, so you can use the Sega CD, Double Impact, SNES, or (ugh) GBA soundtracks! Ah, you are talking about FrankenMAME. That is true. It is the best way to play Final Fight with alternate music in all its glory. @ToAll Fixed some bugs and added per track SPC fallback. Patch now at version 1.5 for only Final Fight Cody. Eventually, I will port the extra stuff to the US and JAP versions of Final Fight Guy. @ToAll Ok, finally decided to merge the newest patch to support both US and JAP regions (Cody/Guy revisions). It adds the additional PCM track support (consult the track map) and SPC per track fallback. @Polargames Thanks. When I’m in the mood, I’ll revisit old code and improve it including PCM work, if necessary. My goal, as time allows, is to implement full per track SPC fallback where possible. @Pepillopev, Your welcome :-D. Wow, full SPC fallback that's a awesome goal to have. If I may ask how far have you come on your goal so far? @Polar So far, three games Contra3, Mickey Mania, and Final Fight. For now, I will take a rest. I still have to finish the full back up of all Zeldix patches (barely finished up to the RPG section). @Pepillopev, Sweet happy that you have three of them done. Now does this also include the pcms with them as well? Take you time on your goal dude, Do not need you to become burned out from it. Especially with having to do the RPG's. I still wish you the best on it and if I was in the same area where your at, I would buy you a beer for all that you have done and one for Conn as well. 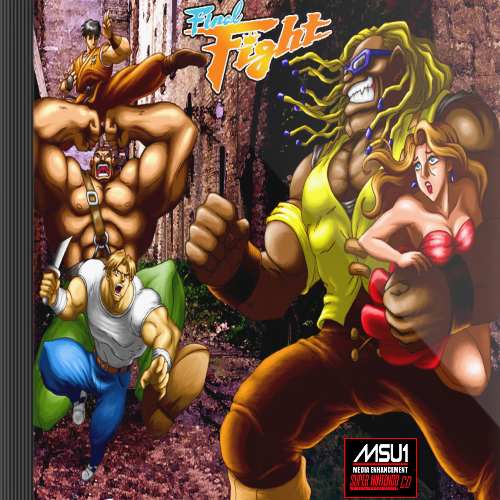 @psalmsamuel Please keep discussions other than “Final Fight” in the General MSU1 column. It is best to keep this topic minimal for reporting issues with the MSU1 patch itself. Anything else needs to go over there. Thanks for understanding. @psalmsamuel Added to the top. You took your own time for this set, take some credit for the work done, not the material itself, . Awesome and thank you for your contribution. I placed it as psalmsamuel "Double Impact Remix" Pack. @Conn I took down the Final Fight link to look it over. FGZ is still having issues getting his ROM to patch. I will re-evaluate my BPS patches and fully make sure the issue is not on my end. Once I am satisfied with the results, I will repost the newly tested BPS patches. @Conn Yeah, you are right. I’ll leave it up while I am still doing my investigation. I still doubt the problem is on my end but will still check to make sure. @ToAll Ok, after some investigation, the BPS patch files are indeed correct. Listed below is the CRC checksums for the original non-patch ROMs required for proper patching. All BPS patch files have the CRC checksum of 2144DF1C. As long as you have these, you will have a successful BPS patch. The Final Fight Guy Japan version is the only one where I shuffled some code around as to not conflict with the unofficial 2-player hack part 06 (no guarantee for the upcoming part 07).